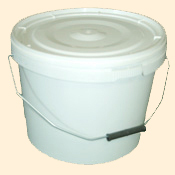 These are not cheap buckets, we have tried them all. These are the highest quality that we use for honey storage ourselves. Strong, rigid and food safe with strong metal handle and snap on air tight lid.